On this week’s Curmudgeon’s Corner Sam and Ivan talk about the latest developments on Trump’s immigration policies, but after that, they do something they haven’t done in a while. Lightning rounds! And ones that include some non-political things too! They can’t avoid SOME additional political talk, but they also discuss wireless headphones, the new discovery of 7 potentially Earth-like planets, Cloudbleed, and more! IC trying to bring down Trump? It isn’t going to slow down, it is? Ivan and Sam take on Week 2 of the Trump presidency, which was just as nuts as the first week. They cover the immigration executive order and the reaction to it, the NSC shuffle and Trump’s contentious calls with Mexico and Australia, the riots in Berkley, the SCOTUS nomination and the Democratic response, what Republicans are planning on Obamacare, 25th amendment possibilities… and a lot more! Oh, and it was Ivan’s birthday. Happy Birthday Ivan! Was it a Muslim ban? 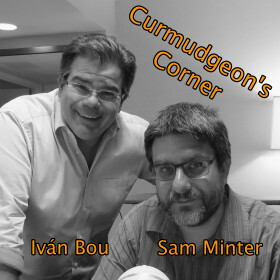 It is back to the normal grind on this week’s Curmudgeon’s Corner with Sam and Ivan. As if there was anything else, they have to start out talking about the explosive “Trump Dossier” and everything surrounding that. Trump and hookers and bribery, oh my! With that out of the way, they talk about Trump’s press conference and the latest developments with the Congress and Obamacare as well. What is congress doing now? Claim victory and go home? This week on Curmudgeon’s Corner Sam and Ivan talk about the assassination in Turkey, the truck attack in Berlin, and of course another week of the Trump transition. We also cover artificial Christmas trees, upside down Christmas trees, the right way to wrap presents, the final electoral college vote, federalism, Ivanka flying coach, and more! How do you defend? Should you?